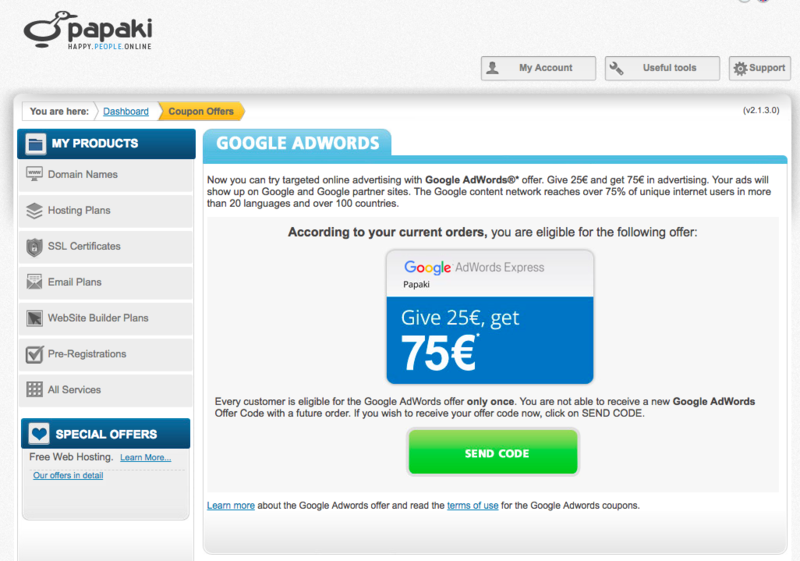 Papaki’s customers get 75€ value of online advertisement! Papaki partners with Google and offers to all its customers the chance to promote their website online and increase their traffic. Register your domain name, create your website, blog, eshop or get an SSL certificate and get an offer code for 75€ value of online advertising with Adwords Express or Google Ads. How can I get the offer? Log in to your account at Papaki. Click “My account” and then “Coupon Offers” from the drop down menu. Find the offer you are eligible for (Adwords Express or Google Ads) and send your offer code to your email. Each customer is eligible for the offer only once. Google Ads is the most popular and largest online advertising platform in the world, allowing you to advertise your website to millions of users in your country and the world, the moment they look for your services and products. It helps you come across potential customers at the right place and precisely the right time, by placing targeted text ads among Google search results, or if you choose so, on other relevant content websites, partnered with Google. Which coupon code am I eligible for (Adwords Express or Google Ads)? Ιf you register up to 10 domain names in your first order, you are eligible for the Adwords Express coupon code. Otherwise, you will get the Google Ads coupon code. If you want to change your coupon (e.g. if you received an Adwords Express coupon but need a coupon for Google Ads), contact our Support Department. I got my offer code, now what? Once you got your offer code, you must create an account at Google Ads or Adwords Express and fill in the code in your settings. If you have questions about the platforms and how to set up your campaigns, read instructions for Adwords Express and Google Ads. Do you want to advertise your shop or website online?